"Dakota's Gate" is a continuation of Farmer's novel Two Hawks from Earth. I fell in love with Roger Two Hawks' character--he's a displaced, romantic soldier just trying to get home. He relies on his instincts as much as his intellect to see him through one crisis after another, and never loses his spirit, though he is quite lonely. What's not to love?! So, I gave him a special someone by introducing a new character, Dakota Cummings, into the Farmer-verse. 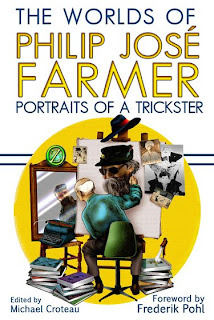 A third venture through the works of Philip José Farmer focusing on his penchant for literary tricksterism featuring essays by Frederik Pohl, Michael Bailey, Steven Connelly, Bruce Sterling, Chris Garcia, Tom Wode Bellman, Jonathan Swift Somers III, David M. Harris, Leo Queequeg Tincrowdor, and Rick Lai and fiction by Charlotte Corday-Marat, Win Scott Eckert, Heidi Ruby Miller, Octavio Aragão & Carlos Orsi, and S.M. 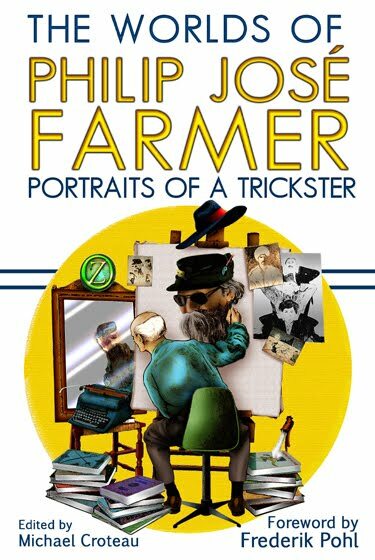 Stirling as well as hard to find, and never before seen works by Philip José Farmer himself. "I get the gist of it from a translator," Dakota said. "Translator?" Two Hawks looked around as though expecting to see a spectacled little man who whispered translations to her. "Implanted in here." She tapped at a spot behind her ear, then inclined her head for his inspection. The night wind teased wisps of her dark hair from her ponytail. He watched those errant strands tickle her neck and became a little jealous. Spiting them, he stooped down and used his fingertips to slide the pieces of hair behind her ear, brushing the side of his hand against her neck in the process. Now he could see a half-moon scar, no bigger than an impression from a fingernail. "Where did you come from?" Two Hawks asked. Enjoyed the interaction between the characters...good stuff! Curiosity can sometimes create more questions than answers. Like this snippet! And, congrats on getting such a wonderful opportunity with the anthology! What an interesting anthology!! The cover art threw me straight into a cafe with literary intellects discussing prose... just saying. Patrick - It was an honor to be invited to the anthology. I'm hoping to do more work for the guys at Meteor House. TK and Chantal - I love the sexual tension between Roger and Dakota. Glad you did, too. Nice buildup of sexual tension in very few words. Beautifully executed. Obviously she comes from a fairly advanced technology--but is that how she got wherever she is? JC - Thanks! You know I like that sexual tension. Sue Ann - I laughed at that last part of your comment! Intriguing. Makes me wonder where she came from as well.